Thank you so much for your interest in having a private function at the Bradenton Yacht Club! Whether you are looking to have a personal private party, a wedding reception or a corporate function, we are sure that you will be thrilled with the quality of food, professional service, and beautiful amenities we offer at the BYC. Our goal at the BYC is to make your private party special! We have an abundance of menu options breakfast, lunch, dinner and even dessert. If there is anything we can to do customize your event, we are more than willing to work with you. Our staff is professional and looks forward to making your event memorable. 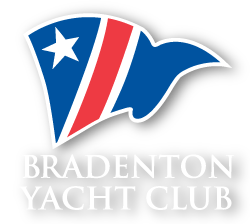 Again, thank you for thinking of the Bradenton Yacht Club for your event needs. We certainly look forward to serving you. Give us a call to set up an appointment to get started with the planning. We'll be happy to chat with you about your visions and ideas for whatever you have planned! Please contact the club's Banquet Manager by calling 941-722-5936.